Career Development makes available to students the information and skills necessary for becoming more marketable and finding satisfying employment in the global job market. Career Development provides support and resources for students, faculty, staff and alumni through individual assistance and professional development programs. Facilitating workshops including but not limited to; Career Planning/Job Search, Resume and Cover Letter Development, Effective Interviewing, Mock Interviews, Workplace Protocol, Business Etiquette and Networking. The office is located in the Student Success Center inside the Winchester Campus Community Center, and is open Monday-Friday from 8 a.m. to 5 p.m.
Wednesday Feb. 6 – Rogers Hall, 5:15- 7:30 p.m.
Each senior will sit down with 12-15 business professionals who will help participants perfect their interview skills. Interview Attire Mandatory! No charge to students. Sunday, Feb. 17 – JCPenney, 3:00 – 6:00 p.m.
Get an extra 40% off business clothing, shoes and accessories. Bring your student ID to receive your special discount. JCPenney staff will be available to help you. Wednesday, Mar. 13 – Cox Conference Room, 5:15-7:30 p.m. The Business Etiquette Dinner will consist of a formal four-course meal and each student will learn the proper manners to be used at a business dinner. Cost: $15 in advance; RSVP: Must make advanced reservations by Friday March 8 in the Cashiers Office. All students welcome. 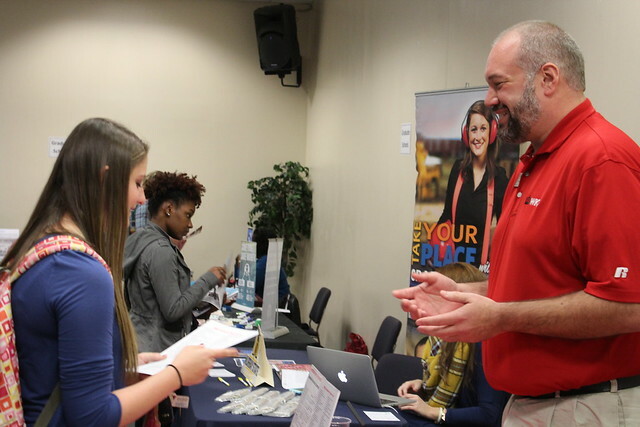 Wednesday March 20, Rogers Hall 10 a.m. – 2 p.m.
Grad Schools, Full-time, Part-time, Summer Job and Intern opportunities. The cost to participate as an employer is $30. April 4 Applying to Graduate School April 18 What’s next? You can find more information and resources regarding the Office of Career Development on PantherNet.